PASAY CITY – Sen. Francis “Chiz” Escudero called for stricter enforcement of the National Integrated Protected Areas System Act of 1992 or NIPAS Act if local government units (LGUs) want to protect their areas from what they deem as naturally destructive activities. Escudero aired the call during a visit to Nueva Vizcaya, one of the provinces being proposed as a mining-free zone by virtue of a bill passed by the House of Representatives and transmitted to the Senate. The bill is a subject of discussion in the Senate Committee on Environment and Natural Resources, which Escudero chairs. Similar bills declaring Catanduanes, Cagayan De Oro, Eastern Samar, Nueva Ecija, Biliran, Davao City, and the second district of Sorsogon as mining-free zones are also slated for review. The bills, which have been opposed by the Joint Foreign Chamber, claimed that mining operations have damaged forest, agricultural lands, river systems and marine resources all over the country. The bills seek to penalize violators with 6 to 12 years of imprisonment and/or fines ranging from P100,000 to P500,000. Escudero said he is waiting for a clear and comprehensive national policy before the Senate can discuss the bills declaring mining-free zones. The Department of Environment and Natural Resources (DENR) has yet to give its recommendations regarding the matter, he added. “Wala pa kami ni isang batas na ipinapasa para ideklara ang isang lugar bilang mining-free zone. Hinihintay kasi namin ang polisiya ng national government. Kanino ba manggagaling ang ganyang polisiya, sa lokal na pamahalaan o sa kanila?” Escudero told media in Nueva Vizcaya. “Baka dumating naman yung panahon, bawat munisipyo, distrito at probinsya dito sa Pilipinas eh magpa-declare na mining-free zone. Eh di kung ganon din naman, magpasa na lang tayo ng batas – parang total log ban – no mining na lang sa Pilipinas,” he said. If the problem is mining in protected areas, LGUs can use the NIPAS Act as ground for disallowing mining operations in protected areas, the veteran lawmaker said. “Halimbawa, kapag merong protected landscape sa isang protected area, talagang dapat walang miningdiyan lalo na kapag malapit doon sa protected area or natural park,” Escudero said. According to Executive Order No. 79 released in 2012, mining is banned in the following areas: agricultural lands covered by the Comprehensive Agrarian Reform Program; protected areas categorized and established under the NIPAS Act; tourism development areas identified in the National Tourism Development Plan; critical areas and ecosystems identified by the DENR; and other areas listed in Section 19 of the Philippine Mining Act. Escudero, who is running as an independent vice-presidential candidate, pointed out that there are mining companies who still manage to comply with the law. He said most of the violators were involved in small-scale mining. “Para sa akin, kung tatanungin niyo ako, hindi kailangang maraming mining, kapag large-scale, ibig sabihin may puhunan talaga yung gagawa, malinis at susunod sa itinatalaga ng batas,” he said. The Gross Value Added contribution of the mining sector to the Philippine economy in 2014 was pegged at P84.2 billion. In terms of exports, mining has contributed a total of P21 billion due to national and local taxes, fees and royalties from the mineral industry last year. BOSTON, MA – Although lithium-ion is the best battery technology we have ever seen, it will not achieve transformative factors of five in cost and performance due to inherent material limitations. Therefore, a new generation of battery technologies will be required in order to address the existing and future challenges of the increasingly complex energy systems in our society. Better batteries will be essential not only in electric cars and consumer electronics but also in wearable electronics, electric boats and aircraft, and throughout the built environment. The brand new report from IDTechEx Research, "Advanced and Post Lithium-ion Batteries 2016-2026: Technologies, Markets, Forecasts," focuses on a variety of new advanced and post lithium-ion battery technologies: silicon anode, solid state, sulphur, lithium air, sodium-ion and magnesium batteries. Whilst existing battery technologies such as lead acid and lithium-ion batteries will dominate the battery market in the following 10 years, advanced and post lithium-ion batteries can potentially take a considerable dent of about 10% of the whole battery market, accounting for $14 billion by 2026. This is mostly because some of them are already in use in niche segments that will present high growth in the following 10 years. A performance benchmark is presented in the report based on practical results achieved so far from different organisations from start-ups, established companies and research organisations. In the report IDTechEx Research analyses challenges and commercial strategies by the companies developing them and provide a 10 year market forecast for 2016-2026. We provide company profiles of the key companies involved in the development and commercialisation of these technologies. Our coverage is global including activities from the US to Asia. IDTechEx builds upon its 15 years experience in analysing 45 electric vehicle segments, the future of electronic devices and emerging energy storage technologies in order to provide a comprehensive analysis of the current state of development of these technologies and its market potential. Carrying out direct interviews with key organisations and attending conferences around the world allows a unique perspective. CAMP LUKBAN, Catbalogan City, Samar – Twelve new 2nd Lieutenants who recently graduated from the Officers Preparatory Course and from the Officer Candidate School were assigned with the 8th Infantry (Stormtroopers) Division, Philippine Army and were formally welcomed during the flag raising ceremony at Camp Lukban, Catbalogan City on November 9, 2015. As part of the Army Command's tradition, the young officers were presented during the flag-raising ceremony and individually, they introduced themselves to the officers, enlisted personnel and civilian employees of the Army Command. Eight of the newly reported young officers are members of Officer Preparatory Course "LAKANDIWA" Class 63-2014 while four are members of Officer Candidate Course "GANDILAN" Class 44-2015. Seven of them are from Luzon, while five are from Mindanao. The new 2nd Lieutenants are: 2nd Lt.Philip R Umblas, 2nd Lt. Jim Kevin Z Dagpin, 2nd Lt. Eljing M. Macutob, 2nd Lt. Jay Rodante F. Figurasin, 2nd Lt. Reyzander K. Ga, 2nd Lt Edgardo B. Bernas Jr, 2nd Lt. Floilan I. Valenzuela, 2nd Lt. Rambi C. Onsat, 2nd Lt. JoseIgnacious V. De Leon, 2nd Lt. Jerome Cob D. Dela Cruz, 2nd Lt. Zaldy P. Lim-Ang, and 2nd Lt Bernabe John M Caro. Prior to their deployment in the different field units, the new officers will undergo the Platoon Leader's Course to refresh them of the military knowledge and skills they acquired from their respective military schools they were honed as military officers. 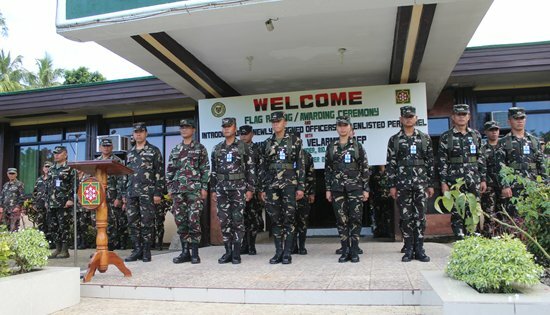 Major General Jet B. Velarmino AFP, Commander of the Army in Eastern Visayas stressed in his message to the new officers the Armed Forces of the Philippines' Core Values, of Honor, Patriotism and Duty. He said, "Cling on to these values and you will never go astray from the narrow path towards becoming an ideal soldier in the mold of our brave and noble military heroes." "The Country and the Filipino people expect much of you. Good luck and contribute as much as you can to the achievement of peaceful and development-ready Eastern Visayas," he added. 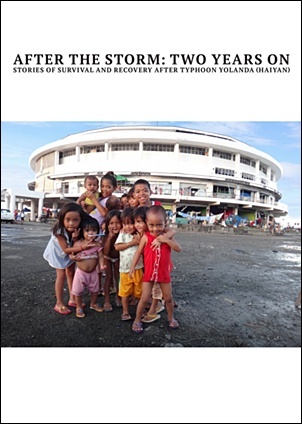 QUEZON CITY – In commemoration of the second year anniversary of Super Typhoon Yolanda, the Department of the Interior and Local Government (DILG) launched Friday a commemorative book entitled "After the Storm: Two Years On", containing compelling stories of survival and recovery of Yolanda survivors. DILG Secretary Mel Senen S. Sarmiento said the book, which was published by the DILG's Recovery Assistance on Yolanda (RAY) project management office, contains first-hand accounts of the survivors from the 93 local government units (LGUs) in 11 provinces whose livelihood and communities were significantly improved with the completed rehabilitation projects under RAY batch 1. "Sigurado akong marami sa inyo ang matutuwa at maiiyak habang binabasa ninyo ang mga nakakapagbagbag-damdaming mga kwento sa aklat na ito lalong lalo na ang mga libo-libong katao na personal na nakaranas sa hagupit ng Yolanda," said Sarmiento. The stories in the collection talk about the courage, determination, and resilience of survivors who were recipients of the big ticket projects under RAY batch 1. These projects include provincial/city/municipal halls, public markets and civic centers costing P1.5 million and above. "Yolanda taught something to us all... That yes, we may be used to storms throughout our lives, and yet we still have a lot to learn about what to do before, during and after such disasters," said DILG Undersecretary Austere A. Panadero in the book. "It's unfortunate that we had to learn the hard way, but what is important is that we rise up from the ruins, learn from the experience and come back stronger and better because of it." "After the Storm: Two Years On" was launched at Leyte Park Hotel, Tacloban City, Leyte during the two-year anniversary event spearheaded by DILG VIII Regional office. The book includes a timeline of the events during Typhoon Yolanda, background of the RAY-DILG Project, and brief overview of RAY batch 1. To ensure the broadest possible reach and scope of the book, a corresponding online multimedia website has been developed to provide "soft-copy" access to readers, both in the Philippines and elsewhere. On 8 November 2013, super typhoon Yolanda (internationally known as Haiyan) struck the Philippines, leaving a trail of devastation in its wake. In partnership with LGUs, and as part of larger government efforts to rehabilitate affected areas, DILG established the RAY DILG Fund. RAY DILG assist in the reconstruction of totally and partially-damaged provincial/city municipal buildings, public markets, civic centers and barangay infrastructure, with view to Building Back Better. RAY DILG aims to facilitate sustainable, long-term recovery and return to normalcy government services and economic activities in Yolanda-affected areas. To find out more, visit http://www.ray.dilg.gov.ph. MANILA – Greenpeace Philippines, Ecowaste Coalition, and Medicins Du Monde (MDM) bring together various civil society groups to strengthen the civil society push on the Extended Producers Responsibility (EPR) Bill on electronic waste (e-waste). “With EPR, we hope to bring about a design revolution that will cut, if not eliminate, hazardous substances in electronic and electrical products and reduce the hazards these products pose during manufacturing, recycling and disposal. By designing toxics out of e-products, we minimize occupational exposure to dangerous pollutants, especially among factory workers and recyclers,” said Thony Dizon, Coordinator of EcoWaste Coalition's Project Protect. QUEZON CITY – Workers’ lobby group Trade Union Congress of the Philippines-Nagkaisa (TUCP-Nagkaisa) lauded the International Labour Organization (ILO) Manila country office for developing a replicable template on social protection coverage for calamity survivors out of its emergency employment and livelihood recovery projects among Yolanda-hit victims. The ILO and foreign donors implemented in April 2014 a P36-million cash for work and livelihood program for 45,000 survivors of super typhoon Yolanda by mainstreaming them to the Social Security System (SSS) and the Philhealth benefits in giving them minimum wage in debris-clearing and reconstruction work. “Though there is a need for SSS and Philhealth do away with stringent qualification requirements for disaster hit population, we commend the ILO and its multi-partite partner donors, agencies and unions for its trailblazing work in creating a template for an effective social protection response for people who fall through the cracks after being hit by disaster. This was proven good for workers and their families who exert effort to rebuild their lives after stricken by calamity,” said Gerard Seno, executive vice president of the Associated Labor Unions (ALU). He added that this template can be replicated in the country or anywhere in the world whenever there would be similar calamities in the future. However, TUCP-Nagkaisa spokesperson Alan Tajusay said the program could have benefitted more people had the SSS and Philhealth set aside stringent requirements for enrollees and made program readily accessible to hardest hit communities. “A set of reforms have been recommended to the SSS and the Philhealth officials to simplify admission coverage on cash-for-work and livelihood program beneficiaries. We hope they make changes immediately because these are the only weak link to an effective social protection response,” Tanjusay said. The recommendation was made yesterday during the ILO briefing on the social protection practice for the emergency employment and livelihood recovery project for typhoon Haiyan. PASAY CITY – Sen. Francis “Chiz” Escudero is calling for a special audit of all funds that have been used for relief, recovery and rehabilitation efforts in communities affected by Super Typhoon Yolanda two years ago. The senator said the Commission on Audit (COA) can conduct a sectoral audit as post-Yolanda rehabilitation and reconstruction work involves different national agencies. A sectoral audit, which is done by the Special Audits Office of the agency, is an audit of programs or activities that are delivered by more than one government agency. The government has released P89 billion of the P167.8 billion needed for the Comprehensive Rehabilitation and Recovery Plan prepared by the Office of the Presidential Assistant for Rehabilitation and Recovery (OPARR). “More than half of the required funding has been released but we have yet to see the results of the projects, programs and activities (PPAs) supposedly funded by this amount,” Escudero said. “From the looks of things, we’re not even halfway through with rehabilitation two years after Yolanda,” he said. Super Typhoon Haiyan, known locally as Yolanda, was the strongest typhoon in the planet’s history to ever make landfall. It caused massive floods and a seven-meter storm surge that killed 6,300 people, injured 28,689, and affected 3.4 million families in the Philippines. To date, more than a thousand people are still listed as missing. Escudero, who visited Tacloban last month, pointed out that thousands are still living in transitional houses and waiting for livelihood assistance from the government. “If the P89 billion has been released but the situation has not improved for many families, then something must be wrong somewhere. Is the process of disbursement slowing down work? Or are the PPAs really not effective?” he said. In 2014, the government targeted the repair of 278 health facilities and 6,624 classrooms but only one rural health unit and 860 classrooms were fixed. Of the 1,982 classrooms planned for construction in the same year, only 101 were completed. Of the target 1,129.6 linear meters (lm) of bridges that required repair and rehabilitation, only 158.5 lm were fixed, while 26 km of the target 56.7 km of roads were repaired. Some 2,100 permanent housing units out of the 3,000 target units were built in 2014. According to the Department of Budget and Management (DBM), the money for Yolanda rehabilitation came from several sources: the 2012 and 2013 Calamity Fund; 2013 and 2014 regular budget of agencies; 2014 and 2015 National Disaster Risk Reduction and Management Fund (NDRRMF); 2014 and 2015 Rehabilitation and Reconstruction Program; 2014 Supplemental Appropriations; and 2013 and 2015 unprogrammed funds. The P89 billion was given to local government units, state colleges and universities and 26 implementing agencies. “We have to have a basis for identifying and addressing difficulties in the rehabilitation program, so we can make changes if necessary,” said Escudero, who vowed to fight bureaucratic red tape when he accepted presidential contender Sen. Grace Poe’s invitation to be her vice president. TACLOBAN CITY – Governors, mayors, local disaster risk reduction and management (DRRM) officers, member agencies of the Regional DRRM Council, the media and other stakeholders in disaster management will meet on November 6, 2015 in Tacloban City to discuss lessons and initiatives to promote resilience among communities two years after Super typhoon Yolanda (Haiyan). 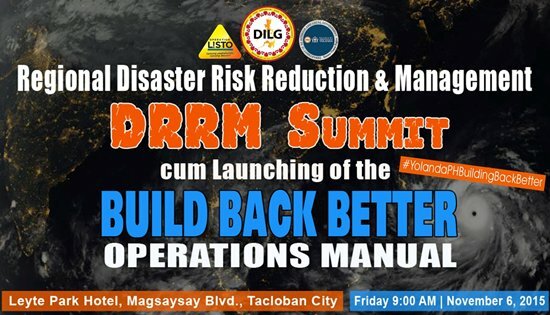 Regional Director Pedro A. Noval Jr. of the Department of the Interior and Local Government (DILG) in Eastern Visayas said that the DRRM Summit will serve to formally introduce the Build Back Better (BBB) Operations Manual produced by the department with the help of the Australian government. Dir. Noval thanked the team of engineers, building managers and local planners from the Australian Volunteers for International Development (AVID) based mainly at the DILG Regional Office in Tacloban City and at the DILG Central Office, who worked with DILG for ten months on the BBB Operations Manual. They studied Philippine building laws, international standards, conducting consultations, training of training of trainers and joining site inspections of ongoing Recovery Assistance on Yolanda (RAY) projects of DILG. “We believe that the BBB Manual if rigorously observed by LGUs, national government and those in local planning and construction, can help ensure safer communities against natural calamities,” said Dir. Noval. The BBB Manual shares insights on what worked and what could have been done better in light of previous disasters. The four modules of the BBB Operations Manual comprehensively detail various stages of post-disaster recovery: Pre and Post Event Infrastructure Assessment, Project Scope, Detailed Design, Documentation Development and Verification, and Construction Quality. Dir. Noval revealed that Josefina Castilla-Go, DILG Assistant Secretary for Operations, Plans and Programs, will be the Keynote Speaker of the DRRM Summit which will start at 9:00 AM at the Leyte Park Hotel in Tacloban. Among those who will be sharing their local government’s experience on preparedness, recovery and rehabilitation will be Leyte Governor Leopoldo Dominico L. Petilla, Ormoc City Mayor Edward C. Codilla and Mayor Christopher Sheen Gonzales of Guiuan, Eastern Samar. The event will also serve to launch and show highlights of the Coffee Table Book “After the Storm” on the DILG RAY project. The book features stories of residents and officials of local governments severely affected by Typhoon Yolanda and relates their road to recovery. OCD Acting Regional Director Dr. Edgar L. Posadas will apprise participants of the regional DRRM Situationer. Further, DILG will share the results of the Core Indicators on DRRM under its Seal of Good Local Governance (SGLG). DILG will also present a video on Operation Listo that shows a checklist of institutional preparations and actions to be followed by LGUs before, during and after a typhoon. Since DILG’s Operation Listo was first adopted in December 2014, there have been fewer deaths in the region due to typhoons.